The system on your computer can be extremely sensitive and is in constant need of your protection. With AutoClose, which is an automation freeware (for personal use) for Windows, completely free and available for you to download it, you now have the power to close down any running programs on your computer. The power is completely in your hands and you get to decide which program and when should be shut down or if you want your system to log off, hibernate or if and when it needs to be rebooted. It makes it easier for you to focus on other tasks at hand, knowing that this part of the job will be taken care of and that your system will not be at risk without you being aware. 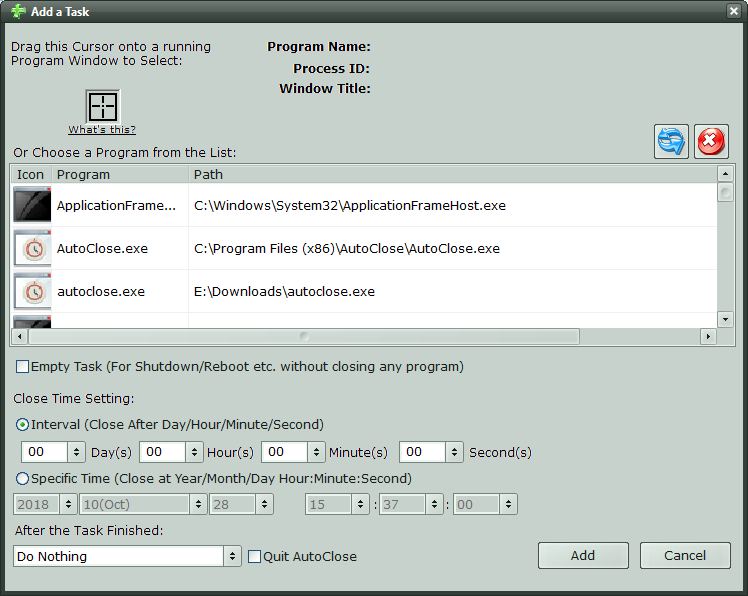 AutoClose is a freeware that deals with several tasks at the same time and gives you the option to have complete control over background tasks. Other benefits of using AutoClose is that it can prevent your computer from heating up and thus, it can prevent malfunction. Battery life is also prolonged, which is especially true for laptop computers because it is a well-known fact that long periods of unnecessary work can shorten the lifespan of a battery. When long periods of use cannot be prevented, for example, when you are downloading a large file, then AutoClose can be useful because it can shut down your system when the work is done, without you having to worry about it. AutoClose will automatically close all programs and log out or shut down after the work is done or after a period of time, you specified. This way, you can go on with your life and this application will make sure your system is safe. AutoClose is very easy to use and free, no matter where you live.